When a youtube clip showing a protester at the 'Occupy Atlanta' protests denying Rep. John Lewis the opportunity to speak, a lot of people took offense. People where trying to figure out 'who in the hell' was the guy that thought he could deny someone like John Lewis a chance to speak to the protesters. Well the people over at Salon.com has answered the question. The young man in question is Joseph Diaz and he is a 24 Ph.D. philosophy student at Emory University looking for a career in political theology. The moment where Congressman Lewis wasn’t allowed to speak to Occupy Atlanta has become racially charged. It looks like a predominantly white crowd turning away a black civil rights hero. So I hate to try to put you in a bubble, but how do you characterize your own ethnicity? No, it’s OK, I think the move to pretend to “color-blindness” is very dangerous. My four grandparents come from Italy, Africa and Spain. I’m a quarter black. In terms of “bubbles,” when I’m filling out forms, I bubble in Latino, black and white. Growing up in Pearl River, my friends were Irish Catholic, and being of mixed race, I was the minority. I’ve never been white enough for the whites, or Latino enough for the Latinos; it’s actually the black community that I’ve felt most at home with. So it’s ironic, the John Lewis thing. Tell me a little bit about the context of the clip. It looked like the crowd was responding favorably to the idea of an impromptu message from Congressman Lewis. I wouldn’t call it consensus, but I’d say a majority expressed openness to it. Am I missing anything there? When Congressman Lewis walked over, much of the crowd began clapping and cheering. There was some conversation between Rep. Lewis and our general assembly (GA) facilitator. This was happening about 20 minutes into our meeting. It’s important to note, this was our fourth GA, and there was a specific agenda drafted, which included “open mic” time for anyone to speak. The question of interrupting the meeting for Rep. Lewis to speak was put to us, and there was certainly strong support, but there were also plenty of dissenters. Then it seems like you “block” him. You expressed respect for his civil rights history, but you stated that no individual is inherently more important. Say more about why you blocked him. My block of Rep. Lewis had more to do with the “form” of the event rather than the content. The Occupy movement was initiated because many of those in attendance feel that rules in our current system have been unjustly bent towards (or created for the sake of the welfare of) politicians and bankers. I felt that bending the rules of the GA towards a politician was contradictory to the spirit of the gathering. Yes, he put his life on the line for people’s rights. Yes, he should be honored for that. But there are construction workers, firefighters, coal miners, etc., who in a very real way put their lives on the line when asked, and we would not have bent the rules for them. Did you support the compromise to ask him speak after the GA’s planning meeting? Absolutely. 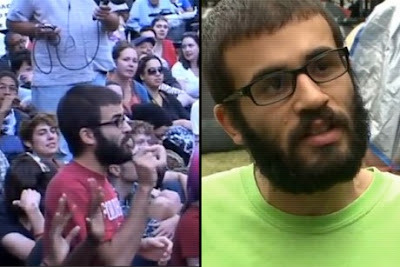 It would be dogmatic and hypocritical to refuse to allow any person to speak at Occupy Atlanta. A lot of people seeing the video had strong feelings — that a civil rights hero was being disrespected. In hindsight, given the reaction to the YouTube clip, would you reconsider blocking him? I would not. I think very soon this will be seen as a tone-setting moment for the Occupy movement. I have personally been very involved in reaching out to the black community here in Atlanta. The real black community. OK, you realize that sounds condescending: “the real black community.” Who’s the real black community? Who decides that? That might have been crude. I’m talking about the segment of the black community here that feels ignored and disenfranchised. Here in Atlanta, there’s very much a class divide. I think a lot of black leadership, and black church leadership, tends to be separated from the urban poor black community. Politically, things have to be pretty noncontroversial for many in the official black church to get involved, and when they do, their answer is, go out and vote for the Democrats! That’s very unsatisfying to a lot of us. Ummm....I really don't know how to respond to this interview. He probably would have been better off just keeping quiet. You would have been better off not posting your opinion. Thats my brother Joe.. In Occupy, it doesnt matter WHO you are, when you come to General Assembly, you have to follow process. Thats just the way it goes. Wait your turn, your word isnt more important than the next man, thats just how it is..